Sony has been in prime position to get into 'hearable tech' for a while now with devices like the WS610 wearable Walkman. And here at CES 2015, it's taking full advantage of the fact that some of its products have already got our ear. We mentioned the Walkman for a reason because the Smart B-Trainer prototype is essentially the same hardware - Bluetooth, NFC, storage for onboard music playback - with added activity tracking smarts. The B in the name stands for beat, as in beats per minute both heart-wise and music-wise. Because the Smart B-Trainer packs GPS, an accelerometer for step counting and heart rate monitoring in the right earpiece. The data it collects is then synced with your smartphone providing the usual metrics - distance, time, calories. A really nice touch is that the B-Trainer adds both audio fitness coaching (we're not sure from which app/program yet) to keep you motivated and even suggests which music tracks to play to match your heart rate. There's no mention of Lifelog compatibility but with Sony opening its life tracking platform out to the likes of Withings, we're sure the B-Trainer will play nice with it. 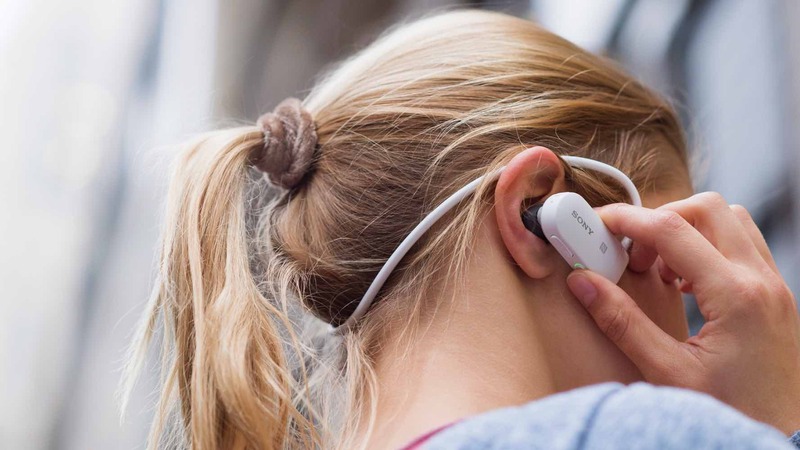 The design is bulkier than earbuds that rely on your smartphone for music storage but the benefit of running with the B-Trainer, no smartphone required, might balance this out. Specs are generally scarce but if the WS610 is anything to go on we could expect 16GB of storage, up to seven hours of music playback, three minutes quick charge for 60 minutes playback and a light weight of around 40g. The wearable Walkman is also waterproof so we're hoping Sony keeps this feature in. The Smart B-Trainer might only be a prototype at this stage but it's one that Sony is looking to launch in 2015. It will join freshly announced (or finalised) rivals such as the Parrot Zik Sport headset and Bragi's Dash wireless earbuds as well as the tried and tested heart rate monitoring Jabra Sport Pulse. There's no price guide to go on yet - the WS610 that the Smart B-Trainer is based on costs £109 but headsets with similar tech, such as the Sport Pulse, are £200 or higher. We're pounding the show floor of CES in Las Vegas as we speak and will be bringing you our first impressions of the Smart B-Trainer and how it stacks up to the likes of the Jabra very soon.